Whether or not you’re planning to use your home as a permanent office space or are just going to meet with clients a few times a week, a workspace that’s not only functional, but beautiful too, could help inspire and motivate you to go the extra mile. Here are some of our favorite ways to create a home office space that’s both functional and fashion-forward. Nothing inspires us more than a sun-drenched space. If your room gets great natural light, use it! Frame your windows with curtains that you can draw should the space get too bright, and choose a fanciful overhead light like a chandelier if your office is go-getter-glam, a table lamp perched on your desk, or a floor lamp in the corner to highlight your accolades on the wall. If you know you’ll be perched at your desk for most of the day, cut yourself some slack and invest in a really great chair or super sturdy desk. Opt for an office chair that’s fashionable and functional, ergonomically correct and comfortable. A durable desk is also a key investment, because you’ll be at it more often than not and it’ll most likely deal with a coffee spill or two. If you’re looking to create an elegant space to write emails and hold client meetings, look for unique textures that add character to your space, like a natural fiber rug, lacquered tables and textured wallpaper. Anyone can create a cookie-cutter cubicle, but by adding texture to your home office you elevate its style from drab to fab. One of the only obstacles we ever run into when curating a home office space is what to do with all of the necessary accessories that accompany our favorite pieces of technology. While you can’t necessarily beautify a printer, you can certainly mask its messiness. Many organizational or office stores now carry cord covers to help disentangle cords, headphones and tech accessories, allowing you to work more efficiently in a less cluttered space. 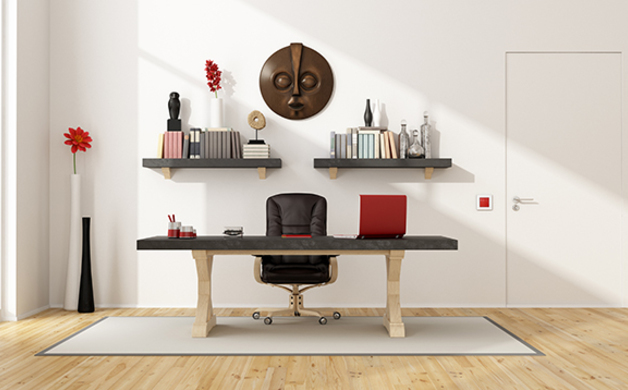 Home offices are a hybrid—they need to be work-appropriate and have homey elements sprinkled throughout, and because most aren’t swimming in square footage, it’s imperative to use each nook and cranny efficiently. For instance, don’t just put storage on the floor in the form of file cabinets or bookcases; instead, install floating shelves, hooks and other wall accessories that will help make your space less cluttered and more work-friendly. When it’s 3 o’clock on a Friday afternoon, the very last thing you want to be doing is editing a business proposal or answering emails. To help bolster your enthusiasm and finish those last little tasks, add inspiration to your space via pictures, art, colors or anything else you love. A few cherished knick-knacks or accessories will help remind you why you’re there and what you’re working toward. 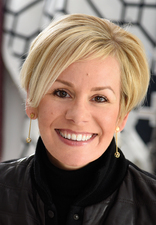 Kerrie L. Kelly is an award-winning interior designer, author and multimedia consultant. She has authored two books: ‘Home Décor: A Sunset Design Guide,’ published by Oxmoor House, and ‘My Interior Design Kit,’ with Pearson Professional and Career Education. To contact her, visit kerriekelly.com or call 916-706-2089.